The Metropolitan Traffic Police Division has planned to increase fine for traffic rules violators terming that it couldn’t reduce the rule violators due to low fine amounts. Officials at the division said the MTPD had been consulting with the Department of Transport Management to increase the fine up to Rs10,000 for traffic rules violators. “We have been charging a minimum of Rs500 to maximum Rs1,000 for various traffic rule violations. But people are not taking the traffic rules seriously,” said Senior Superintendent of Police Basant Pant, who is also chief at the Division. Pant said the government needs to amend the Transport Management Act to bring changes in the fine amount and the Department of Transport Management has taken necessary steps to this end. The metropolis has been booking bikers and motorists for violating traffic rules, with those booked for drink driving (MaPaSe) being fined Rs1,000. The division charges Rs3,000 for the first time, Rs5,000 for second time and Rs10,000 for the third time once the new rules comes into effect. Similarly, the MTPD plans to increase the fine amount from Rs1,000 to Rs 5,000 against those found guilty in cases related to hit-and-run and violation of one-way rule. And those caught violating lane discipline will have to pay Rs5,000, up from the current Rs500. According to the five-year report compiled by the department, there has not been a significant drop in traffic rules violations among motorists and bikers. The report shows the department booked 548,470 rule violators in the fiscal year 2014/15, and 472,407 in the last fiscal. It has booked 305,953 for rule violations in seven months of the current fiscal. “We have been issuing tickets for violating traffic rules, but people have remained indifferent towards following the rules. 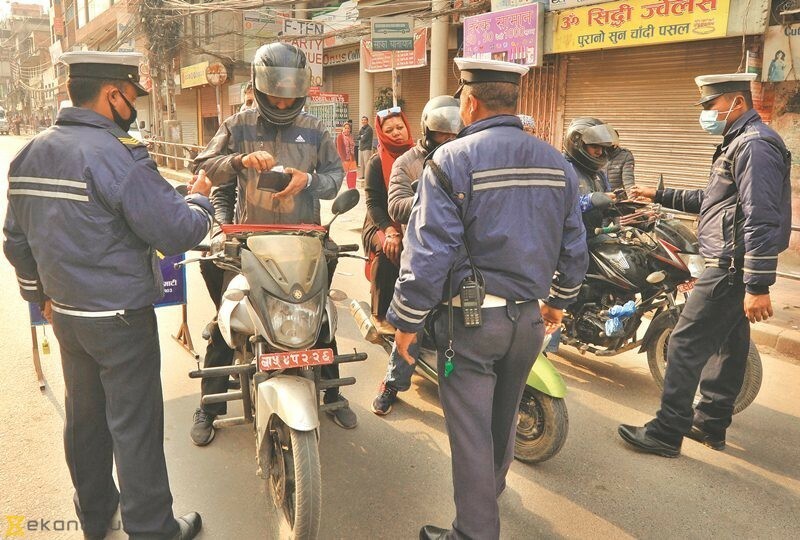 I believe the rise in fines will make them more cautious while on the roads,” said Jay Raj Sapkota, MTPD spokesperson, adding that the division will be holding a series of traffic-related awareness programmes before the new rules are implemented.